When Puma entered the golf arena in 2006 I got excited. As readers of my website most of you know that I am a “style junkie”. Many of you also know that I very much prefer the look of the European Style of clothing. Well Puma Golf was no exception. Created for individuals looking to make a statement and stand out from the pack on and off the course, their line has been well received by players and fans across the world. With the color palette and creativity that Puma has always shown in the past, it made perfect sense that they were the company for THP to kick-off BELT WEEK 08. 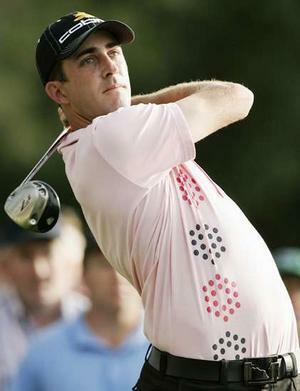 I got hooked on Puma Golf when I saw Geoff Ogilvy win the US Open wearing their gear. 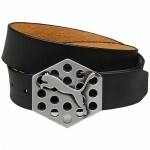 Each season I anxiously await the new arrivals of golf wear and accessories from Puma. This year was no exception. This year’s merchandise looks as good as it ever has, but we will keep this profile strictly on the belts. Puma apparel will be talked about during Spring Fashion Week 09 at a later date and of course you will not want to miss that. 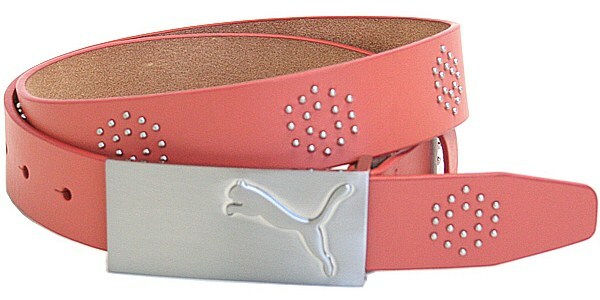 Puma belts bring style and color like no others that we have seen. 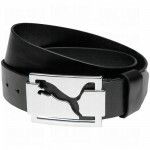 The one thing that sets Puma apart from many other brands of belts is their “belt style diversity”. 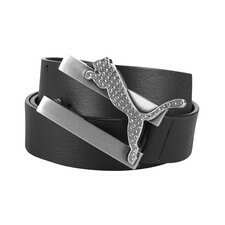 What we mean by that is you can pick up a belt that is very classic and traditional looking. Or you can go to the PUMA EXTREME and get a belt and buckle full of “bling”. They have you covered either way. I prefer the latter of the two. traditional waist sizes, the belt comes in Small through X-Large and nobody had a problem finding a size that fit them right when we did an impromptu trial at the Puma Store. This particular model is available in five different colors and depending on the color leather you choose, you will either get a silver buckle (white, brown, or black leather) or gold buckle (green or light brown leather). The ladies belts that arrived can be considered both classic and contemporary. They are called the Ladies Golf Rivet Belt. They are available in black, white, pink, and brown. The reason that this belt was so liked was just how “bridged” it was. 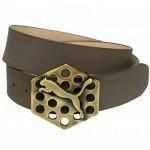 This belt could be worn on the golf course and then thrown on with jeans to go out to lunch or dinner. The pattern on the side in rivets is that same hexagon pattern used in the men’s series we received. The fun could not stop there though. When THP profiles belts, we always have to get a little crazy. So since the belts that were sent our way from Puma were a little tamer than we expected, we dropped by our local Puma store and picked up one that fits our style. It features two bars with their logo on top. The key is that the logo is a little “dolled up” for the occasion. Golfer Gal saw it and became giddy at the thought of wearing this little gem out on the course. She did so, and has not taken it off since then. The entire Puma Golf collection is as colourful as the brand’s signature sportlifestyle products. A pastel palette is accented with punches of bright colors for a bold, eye-catching collection. Their belts are no different. Puma has once again blown us away with their goods. We urge any belt fan to check these out. They can be found at many retailers as well as Their Online Store. You can go classic and traditional with Puma, or you can go The Hackers Paradise way and go LOUD. Either way, you are covered with Puma Golf. I never really have a chance to look at Puma golf stuff. This was a great insight in some of their items. I look forward to hearing more. I am in love with that rhinestone belt. I am ordering one today. These are seriously nice. I am more of a traditional guy, but some of these are just gorgeous. THP is going to bankrupt me. A great review of great golf gear. 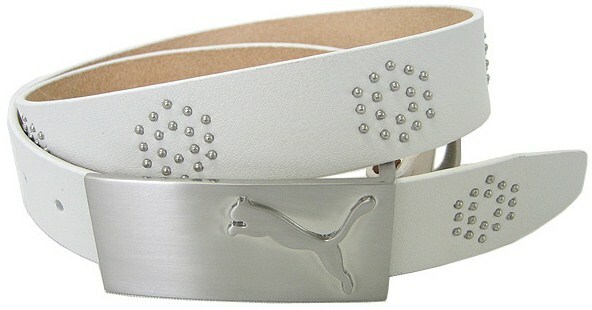 Puma are certainly a leader when it comes to golf belts. I also like that they make a brown colored belt so I can match it with my tan colored golf shoes. Most other golf belt manufacturers seem to ignore that. 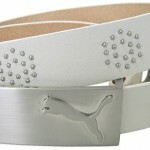 Love the rhinestone puma! Blingy belts are such a great way to show some style and not get in the way of my golf swing. how the hell do you order one? Good site! I adore numerous of the articles which have been written, and particularly the Vibram Five Fingercomments posted! I will undoubtedly be visiting once again!